Star Wars: The Last Jedi is possibly the best Star Wars movie since Empire Strikes Back. Only “possibly” because I don’t think its a fair comparison of Original Trilogy to any of the subsequent movies. 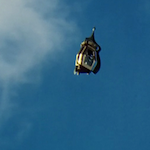 This post is not so much a review as it is some of my random observations, with spoilers. I like the way this new trilogy doesn’t just mirror and invert the other movies, but also learned from the history they created a long time ago in a galaxy far, far away…. Star Wars: The Last Jedi is better the second viewing, I thought. After it was over the first time, I bought a ticket to the next showing and watched it again. That’s more than I can say for any of the other first-run Star Wars movies I’ve seen in the theater as an adult, which is The Force Awakens and all of the prequels. I liked Last Jedi more the second viewing than the first mostly because I wasn’t thinking about Princess Leia. I was consciously thinking about how the movie would address the loss of Carrie Fisher the first time I saw Last Jedi. The second viewing, I knew that Princess Leia would live through it and was able to focus more on everything else. Last Jedi gives us a very dignified and graceful final performance by Carrie Fisher. The scene where Leia uses the Force has been criticized by some Star Wars fans. I find their lack of faith disturbing. We know the Force is in Leia’s genes. Telekinesis is a way of using the Force. Force pull and Force push are well-established in the Star Wars universe. Even if Leia had no formal Jedi training, I think some Jedi instinct in her DNA would cause her to pull herself back towards the spaceship. Leia’s use of the Force seems reasonable. Luke also uses a new astral projection Jedi trick later on in the movie. Its just a given that Star Wars movies once in awhile introduce new uses for the Force. This movie gives us Old Luke Skywalker. Up until now, we’ve only known Young Luke Skywalker. In Last Jedi, Luke is at the end of his journey from non-Jedi in A New Hope, apprentice Jedi in Empire Strikes Back, journeyman Jedi in Return of the Jedi, and now cranky old Jedi master. Luke’s X-wing starfighter is entirely submerged when we first see it in Last Jedi. The previous time it was submerged was an accident when he landed on Dagobah for Jedi training from Yoda in Empire. This time, the X-wing is underwater on purpose. Luke doesn’t want to leave. Along with the underwater spaceship, there’s another parallel from “Empire Strikes Back”. Like Yoda in Empire, Luke initially refuses to train and then reluctantly trains anyway. Mark Hamill has said in interviews that this Luke Skywalker isn’t his version of Luke Skywalker. I can understand that. This is Old Luke Skywalker and Mark Hamill’s version up until now has been Young Luke Skywalker. I think Last Jedi’s Luke Skywalker is probably what retirement age Luke would actually be like. In Original Trilogy, Luke was young and willing to follow old Obi-Wan on some damn idealistic crusade. For Young Luke, the Force was something new and exciting. For Old Luke, the Force is something he’s been practicing for most of his life. He’s already fought the Empire once, thought he was done with that, and now he just doesn’t have the patience or energy to deal with that again. He just wants these kids to leave him alone and stay off his lawn. 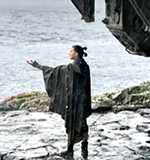 Rey gets her Jedi training. I would’ve liked the movie to have shown more of her interaction with Luke. What we don’t get in Last Jedi is an answer to Rey’s parents. She gets a vision where she tries to figure it out and sees only herself. That seems like a call-back to Phantom Menace and its allusion that Anakin was some sort of immaculate conception. I’ve never thought that was the real story with Anakin. I also don’t think that’s the real story with Rey. Hopefully, we’ll get more of Rey’s backstory in Episode IX. Rey also noticeably wears a sports bra in some scenes. That shouldn’t matter, except it distracts from the fantasy that this all takes place “a long time ago in a galaxy far, far away”. Where on the desert plant of Jakku did she find a department store to buy a well-fitting sports bra? I’m reminded of a conversation between Carrie Fisher and George Lucas during the original Star Wars that she would occasionally mention in interviews. Carrie wanted to wear a bra. George Lucas told her matter-of-factly, “There’s no underwear in space.” George Lucas was right. The Force Awakens made clear that Ben, as Kylo Ren, intends to succeed where Darth Vader failed. It was Anakin Skywalker’s control by Emperor Palpatine that led to his downfall. Ben Solo knows his Star Wars history and had no intention of being some pawn for Snoke. Ben Solo killed his father, Han Solo, and I believe that Ben Solo would kill Snoke. In fact, I think that was probably Ben’s plan all along. He was just waiting for the right opportunity to eliminate Snoke and take control. The scene in the Throne Room with Snoke, Ben Solo, and Rey is well done. This is where Last Jedi gets especially smart and, for me, makes the movie worth writing about. Based on The Force Awakens and the plot thus far in Last Jedi, we think as the audience that this trilogy is another master-apprentice story. We think this will foreshadow a confrontation in the next and final movie of the trilogy, where Ben Solo and/or Rey will confront Supreme Leader Snoke. Then Ben Solo cuts Snoke in half with a lightsaber. The battle in the Throne Room that follows is possibly my favorite lightsaber battle in any Star Wars movie. Original Trilogy had red hooded Imperial Guards but they just stood there and didn’t do anything. In this movie, the guards are actually useful. I was surprised to see the guards actually start fighting and get in on the action. Then the Throne Room catches fire. Then after all that, the movie takes the time to figure out how to deal with the aftermath. Admiral Ackbar earns a special mention. Admiral Ackbar fought in, and survived, the Battle of Endor. And here he is, more than thirty years later, in both Force Awakens and Last Jedi, still sitting on the bridge of a cruiser, commanding an entire fleet of ships, and fighting for the Resistance. 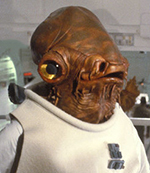 I’ve read arguments on both sides: Admiral Ackbar Deserved Better versus Getting Mad About Admiral Ackbar Is A Trap. The people that think of Admiral Ackbar as a throwaway character don’t appreciate his significance in Star Wars history and aren’t true Star Wars fans. Admiral Ackbar earned a hero’s exit. Admiral Ackbar deserved better. Star Wars movies are always kind of an ensemble cast where even smaller characters have well-developed side stories. I don’t have much to say about Fin, Poe, or some of the other characters. And there’s no real need to go into detail about all of them. Fin meets up again with Captain Phasma. Poe gets more time battling in a spaceship. Vice Admiral Holdo, played by Laura Dern, is an interesting character. DJ, played by Benicio Del Toro, is a mercenary that seems intended as this trilogy’s Boba Fett. It occurred to me when I first saw the casino that I had never seen a casino in a Star Wars movie. And a space casino where everybody in the galaxy goes to gamble just seems like the kind of place that would be perfectly at home in a Star Wars movie. Its like an upscale version of the Mos Eisley Cantina, only for rich scum and villainy instead of poor scum and villainy. On a side note, if the filmmakers wanted to imply that Episode IX will bring this trilogy back where we began in Episode I, as they kinda imply from this movie’s ending, Canto Bight might’ve been a good place to show some podracing. The only thing I didn’t like about Last Jedi was the very last scene. Maybe the next movie in the trilogy will change its relevance and my opinion, but I doubt it. All Star Wars movies end with a shot of at least one, and usually more, of the main characters. I understand the idea of showing the kid with the broom was probably intended to show that there was hope for future Jedi and maybe call-back to young Anakin Skywalker at the beginning of Phantom Menace. But showing a totally new character at very end of the movie breaks, not just Star Wars tradition, but the overall flow of the movie and emotional investment we’ve built-up in the main characters over the previous two hours. If they were going to show some random kid with a broom, they should’ve put that at the end of Episode IX. So how would I have edited the ending? As he stares off into the binary sunset, Old Luke Skywalker just disappears.